As aggressively as I seek creative ways to express nature with my camera, and as important as I think that is, sometimes a scene is so beautiful that it’s best to just get out of the way and let the scene speak for itself. I had one of those experiences last month at Tunnel View in Yosemite. There’s a reason Tunnel View is one of the most photographed vistas in the world: El Capitan, Half Dome, Cathedral Rocks, Bridalveil Fall—each would be a landscape icon by itself; put them all together in one view and, well…. But the view this evening was truly transcendent, even by Yosemite standards. In Yosemite Valley below, trees and granite still glazed with the snowy vestiges of a departing storm seemed to throb with their own luminance. And above Half Dome a full moon rose through a sky that had been cleansed of all impurities by the departing storm, an otherworldly canvas of indigo, violet, and magenta. On these crystal-clear, winter-twilight moonrises, the beauty rises with the moon, reaching a crescendo about 20 minutes after sunset, after which the color quickly fades and the landscape darkens. Unfortunately, a some point before the crescendo, the dynamic range becomes so extreme that no camera (not even the dynamic range monster Sony a7RIII) can simultaneously extract usable detail from a daylight-bright moon and dark landscape. I’d driven to Yosemite solely to photograph this moonrise, an eight hour roundtrip for 40-minutes of photography. Starting with the moon’s arrival about 20 minutes before sunset, I’d juggled three camera bodies and two tripods, first shooting ultra long, then gradually widening to include more of the snowy landscape. Already my captures had more than justified the time and miles the trip would cost me, but watching the moon traverse the deepening hues of Earth’s shadow, I wasn’t ready to stop. I’ve learned that with a scene this spectacular, conveying the majesty doesn’t require me to pursue the ideal foreground, or do creative things with motion, light, or depth of field. In fact, I’ve come to realize that sometimes a scene can be so beautiful that creative interpretations can dilute or distract from the very beauty that moves me. On this evening in particular, I didn’t want to inject myself into that breathtaking moment, I just wanted to share it. To simply my images, I opted for a series of frames that used tried-and-true compositions that I’d accumulated after years (decades) of photographing here, the compositions I suggest as “starters” for people who are new to Yosemite, or use myself to jump-start my inspiration: relatively tight horizontal and vertical frames of El Capitan, Half Dome, Bridalveil Fall; El Capitan and Half Dome; or Half Dome and Bridalveil Fall. In the image I share above I concentrated on Half Dome and Bridalveil Fall, capping my frame with the wispy fringes of a large cloud that hovered above Yosemite Valley. Simplifying my compositions had the added benefit of freeing all of my (limited) brain cells to concentrate on the very difficult exposure. The margin for error when photographing a moon this far after sunset is minuscule—if you don’t get the exposure just right, there’s no fixing it in Photoshop later: too dark and there’s too much noise in the shadows; too bright and lunar detail is permanently erased. The problem starts with the understandable inclination to expose the scene to make the landscape look good on the LCD, pretty much guaranteeing that the moon will be toast. Compounding this problem is the histogram, which most of us have justifiably come to trust as the final arbiter for all exposures. But when a twilight moon (bright moon, dark sky) is involved, even the histogram will fail you because the moon is such a small part of the scene, it barely (if at all) registers on the histogram. Rather than the histogram, for these dark sky moon images I monitor my LCD’s highlight alert (“blinking highlights”), which is usually the only way to to tell that the moon has been overexposed. If the moon is flashing, I know I’ve given the scene too much light and need to back off until the flashing stops—no matter how dark the foreground looks. This is where it’s essential to know your camera, and how far you can push its exposure beyond where the histogram and highlight alert warn you that you’ve gone too far. When I’m photographing a full moon rising into a darkening sky, I push the exposure to the point where my highlight alert just starts blinking (only the brightest parts of the moon, not the entire disk, are flashing), then I give it just a little more exposure. I know my Sony a7RIII well enough to know that I can still give it a full stop of light beyond this initial flash point and still recover the highlights later. The shadows? In a scene like this they’ll look nearly black, a reality my histogram will confirm, but I never cease to be amazed by how much detail I can pull out of my a7RIII’s shadows in Lightroom and Photoshop. I continued shooting for several minutes after this frame, and discovered later that even my final capture contained usable highlights and shadows. I chose this image, captured nearly five minutes before I quit, because it contained the best combination of color, lunar detail, and clean (relatively noise-free) Yosemite Valley. Do these sound like the thoughts of someone lamenting the camera’s “artificial limitations” and photography’s inability to duplicate the world the “way we saw it”? Take a look at just a few of Ansel Adams’ images and ask yourself how many duplicate the world as we see it: nearly black skies, exaggerated shadows and/or highlights, and skewed perspectives that intentionally emphasize one subject over another, and on and on. And no color! (Not to mention the fact that every image is a two-dimensional rendering of a three-dimensional world.) Ansel Adams wasn’t trying to replicate scenes more like he saw them, he was trying to use his camera’s unique (not “artificial”) vision to show us aspects of the world he wanted us to see, qualities we might otherwise miss or fail to appreciate. The rest of the OP article contained solid, practical information for anyone wanting to come closer to replicating Ansel Adams’ traditional darkroom techniques in the contemporary digital darkroom. But the assertion that photographers are obligated to photograph the world as they saw it baffles me. The camera’s vision isn’t artificial, it’s different. Dynamic range, focus, motion, and depth are all rendered differently in a camera than they are to the human eye. And while the human experience of any scene is 360 degrees, a still images is constrained by a rectangular box. Forcing images to be more human-like doesn’t just deny the camera’s unique ability to expand viewers’ perception of the world, it’s literally impossible. Which is why I’ve always felt that the best photographers are the ones who embrace their camera’s vision rather than trying to “fix” it. For example, limiting dynamic range allows us to emphasize color and shapes that get lost in the clutter of human vision; a narrow range of focus can guide the eye and draw attention to particular elements of interest and away from distractions; and the ability to accumulate light over a photographer-controlled interval exposes color and detail hidden by darkness, and conveys motion in an otherwise static medium. But what about that rectangular box that constrains the world of a still image? I can think of no better way to excise distractions and laser-focus viewers’ attention on the target subject than taking advantage of the camera’s finite world. While many nature photographers default to their wide angle lenses to expand the visual box surrounding their landscape images and save their long lenses for wildlife, a telephoto lens is an essential landscape tool. The world can be a busy place—in even the most spectacular of vistas, so much is happening visually that going wide in a still photo to include as much beauty as possible introduces many extraneous features, and risks shrinking the scene’s most compelling elements to virtual insignificance. The best way to overcome wide angle scene dilution is to forego the conventional view (the first thing everyone sees), identify the aspects of the scene that make it special, and isolate them with a telephoto lens. Whether it’s a striking mountain or tree, backlit poppy, or rising moon, isolation enlarges the target subject and removes any ambiguity about what the image is about. And an intimate, up-close perspective of a subject more commonly seen from a distance can be truly mesmerizing. I stood atop two feet of packed snow at Tunnel View, more than eight miles from Half Dome, and ten miles from the ridge that would be ground zero for the moonrise that had drawn me in the first place. Along with two other photographers who also seemed aware of the moon’s plans, I had the best (least obstructed) Tunnel View vantage point to myself. Rising full moon or not, before me the table was set for a spectacular Yosemite feast: Brand new snow glazed every exposed surface, and in the pristine winter air, Tunnel View’s veritable who’s who of Yosemite landmarks—El Capitan, Cloud’s Rest, Half Dome, Sentinel Rock, Sentinel Dome, Cathedral Rocks, and Bridalveil Fall—seemed etched into the scene. Above, dark clouds boiled atop El Capitan, while wispy fog radiated from the valley floor. Occasionally a tourist would wander up and request help identifying Horsetail’s microscopic filament on El Capitan’s vast granite; one or two even pointed at Bridalveil Fall and asked if that was Horsetail Fall. A couple of people, blissfully oblivious to the Horsetail Fall phenomenon, simply wanted their picture taken with this iconic Yosemite backdrop. About 150 feet down the wall to my right, at least two-dozen photographers on tripods were inexplicably crammed into a significantly less desirable view. While that vantage point gave them an acceptable sightline to Horsetail Fall (as did my own), the rest of the magnificent Tunnel View vista was partially obscured by trees. The only explanation I could muster for their odd choice was that the first to arrive for some reason set up there, and each subsequent photographer assumed that since others have set up here, this must be the spot. While Horsetail Fall was irrelevant to my objective this evening, the overnight snow still clinging to the trees was undeniable bonus. Getting to Tunnel View had been an adventure, worse even than I’d expected, and I was glad that I’d allowed ample time. The difficulty started with a 30-minute (Horsetail Fall gawker infused) queue at the Arch Rock entrance station. My suspicion that these were mostly inexperienced photographers and tourists (who’d just read an article or seen a news segment and decided to check it out) was confirmed when I was forced to navigate a slalom course of slipping, sliding, spinning cars that had ignored the very clearly communicated chain controls. The serious photographers, those who had photographed Horsetail Fall before, or who had the sense to research the phenomenon well in advance, had been in position for the five-minute show for hours. With the moon’s imminent arrival upon a scene that already bordered on visual overload, my plan to ensure that the main purpose of my visit didn’t get swallowed by Tunnel View’s conventional post-storm majesty was to start, while the moon was still right on the horizon, with extremely tight compositions. As the moon rose, I planned to widen my focal length, gradually including more scene and turning the moon into more of an accent. To achieve this, I was flanked by two tripods, and had three camera bodies fired up and ready for action: my Sony a7RIII, a7RII, and a6300. Atop my Really Right Stuff TVC-24L tripod was my a6300 loaded with my Sony 100-400 GM and Sony 2X teleconverter. This combination gave me a 600-1200mm full-frame equivalent focal range (because the a6300 is a 1.5-crop APS-C sensor). When including the rising moon required reducing my focal length below 800mm, I’d switch to my higher resolution, full frame Sony a7RII. And because the moon would rise just about 20 minutes before sunset, I also had to be aware of the possibility that Horsetail Fall would fire up. To handle that possibility, and to cover all my general wide composition needs, mounted on my RRS TQC-14 tripod was my Sony a7RIII and Sony 24-105 f/4 lens. I pointed my a6300/100-400 at the point where I expected the moon to appear about 20 minutes before sunset, zoomed all the way out to 800mm (1200mm full-frame equivalent), metered, focused, and waited. I started clicking almost immediately after seeing the moon’s leading edge nudge through the trees, refining my composition slightly after each click until I had the right balance of moon and Half Dome. It always surprises me how quickly the moon moves, speed that’s magnified tremendously at such an extreme focal length. Spending the next 40 minutes frantically changing focal lengths, switching lenses and camera bodies, re-metering and re-focusing, and bouncing between tripods, I felt like the percussionist in a jazz band. When the moon climbed far above Yosemite Valley and the dynamic range between the daylight-bright moon and nighttime landscape made photography impossible, I paused before packing up my gear and just marveled at the beauty. Horsetail Fall had caught a few late rays of sunlight but never did completely light up. I thought about the disappointment of frigid photographers who had waited patiently in the valley below for a show that didn’t happen, and counted my blessings. Last week’s Yosemite photo workshop was ostensibly about Horsetail Fall, but it turned out to be so much more than that. In fact, after photographing more snow than I’ve seen in Yosemite in many (many) years, Horsetail Fall was a bit anticlimactic. The only evening that Horsetail Fall got the coveted direct light everyone came on our second day. Going all-in on Horsetail Fall that evening, we got a decent (not spectacular) show that satisfied everyone enough that they were content to return our attention to the rest of snow-covered Yosemite Valley. Ironically, what could arguably be called the best shoot of a workshop filled with spectacular shoots might just have been at the mega-popular, always packed view of Horsetail Fall on Southside Drive—on an evening when fall didn’t quite light up. To get here we had to trudge 50 yards through 3- to 4-foot deep fresh powder, but we were utterly alone (unprecedented in my many years photographing Horsetail Fall) to watch sunset paint a diffuse glow on El Capitan and magenta clouds overhead. And as the first visitors here since six-inches of snow had erased all evidence of prior human presence, we got to photograph the scene framed by virgin white snow glazing every exposed surface. Yesterday I returned to Yosemite, making the 8-hour roundtrip not to photograph Horsetail Fall, but to photograph the full (“super”) moon rising behind Half Dome at sunset. But before setting up shop at Tunnel View, I couldn’t resist circumnavigating Yosemite Valley to check out the Horsetail Fall mayhem. With new snowfall decorating the trees and blanketing the roads, conditions were equal parts beautiful and treacherous. Unlike last year, the National Park Service isn’t requiring permits, but they have blocked off many normally open parking areas. Cruising around in my Subaru Outback, I witnessed multiple cars that had foolishly ignored the R2 chain requirement (chains except for 4WD/AWD with snow tires) slipping, sliding, and spinning tires unproductively—some sliding backward downhill and others blocking the road. I also saw many cars parked illegally on the road or in closed parking areas. Given the fact that Horsetail Fall didn’t deliver last night, I doubt they’ll feel that their parking tickets (or towing bill) were worth the indiscretion. I also talked to people who pulled into Tunnel View 30 minutes before sunset hoping to photograph Horsetail Fall. Some even thought that Bridalveil Fall was Horsetail Fall. If you plan to photograph Horsetail Fall, please do your homework. It truly can a remarkable experience, but it can also be a nightmare for the unprepared. For eleven-plus months each year Horsetail Fall may just be Yosemite’s most anonymous waterfall. Usually dry or (at best) a wet stain, even at its best this ephemeral cataract is barely visible as a thin white thread descending El Capitan’s east flank. When it’s flowing, my workshop groups can be standing directly beneath Horsetail and I still have to guide their eyes to it: “See that tall tree there? 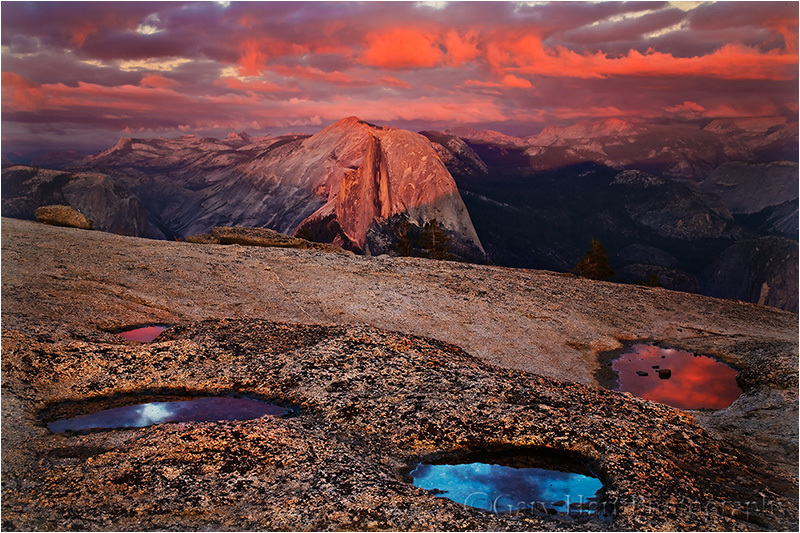 Follow it all the way to the top of El Capitan; now run your eye to the left until you get to the first tree…”. But for a couple of weeks in February, the possibility that a fortuitous confluence of snowmelt, shadow, and sunset light might, for a few minutes, turn this unassuming trickle into a molten stripe draws photographers like cats to a can-opener. Some years Horsetail delivers sunset after sunset in February, while other years administer daily doses of February frustration. Unfortunately, it’s impossible to predict when all the tumblers will click into place: I know photographers who nailed Horsetail on their first attempt, and others who have been chasing it for years. The sun’s angle is refreshingly predictable, lining up perfectly only in February (and October, when the fall is almost always dry). Common wisdom says the shadow on El Capitan most precisely targets Horsetail Fall at sunset during the third week of February, from around the 15th through the 22nd (or a little later). While I won’t dispute this, I’ve had some of my best success a week earlier, and my favorite Horsetail shot was captured February 9. I’ve also had success photographing it right up until the end of February. On the other hand, I tried Horsetail once on March 1 and found the shadow no longer cooperating. But the stripe of sunset light on El Capitan is most precisely focused on Horsetail Fall in the third week of February. Water in the fall varies greatly from year to year, depending on how much show has fallen on the fall’s extremely small watershed, and how much of that snow is currently melting. A large snowpack and warm daytime temperatures are ideal. Sometimes Horsetail can be frozen solid in the morning, but afternoon warmth can be enough to get it flowing in time for the show. And a heavy rain can get it going strong for a few hours. Direct sunlight at sunset is the most fickle aspect of the Horsetail experience—for every tale of a seemingly perfect evening when the sunset light was doused by an unseen cloud on the western horizon mere seconds before showtime, there’s another story about a cloudy evening when the setting sun somehow threaded a gap in the clouds just as tripods were being collapsed. The problem with targeting February’s third week is that it isn’t a secret: I generally prefer sacrificing Horsetail perfection in favor of Horsetail near perfection and far fewer photographers. But I’ll leave that decision up to you. It’s fun to circle Yosemite Valley on pretty much any mid- to late-February afternoon just to watch the hoards of single-minded photographers setting up camp like iPhone users on Release Day. In fact, one non-scientific way to find a spot to photograph Horsetail is to simply park where everyone else parks and follow the crowd. Unfortunately, as Horsetail’s popularity grows, so does the distance you’ll need to walk. If Horsetail Fall is on the top of your bucket list, it’s best to pick your spot and show up early. Really early. Really, really early. The downside of this approach is that, because the best locations for Horsetail aren’t especially good for anything else, you’ll sacrifice a lot of quality Yosemite photography time waiting for something that might not happen. And no one has commanded that you worship with the rest of the Horsetail congregation: Experienced Yosemite photographers know that any west-facing location with a view of the fall will do. If you find yourself in Yosemite with time to kill, try walking the Merced River between Cathedral and Sentinel Beaches—any place with a view to Horsetail will work. But because of their open space, relative ease access and two spots have become the go-to Horsetail spots for most photographers. – Stopping or parking on Southside Dr between El Cap Cross and Swinging Bridge is prohibited. – All pullouts along Southside Dr between El Cap Cross and Swinging Bridge are closed. – Roadside parking along Southside Dr between El Cap Cross and Swinging Bridge is prohibited. – Southside Dr between El Cap Cross and Swinging Bridge is closed to pedestrians. – The Cathedral Beach Picnic Area is closed. – The Sentinel Beach Picnic Area is closed. – Stopping or parking on El Cap Cross is prohibited. – Roadside parking along El Cap Cross is prohibited. – The number 2 lane (right, northern lane) of Northside Dr between Camp 4 and El Cap Cross is closed to all vehicles. – Stopping or parking on Northside Dr between Camp 4 and El Cap Cross is prohibited. 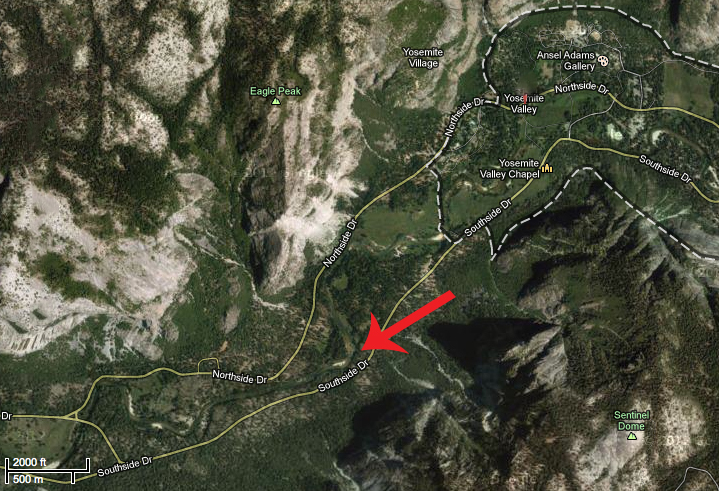 – All pullouts along Northside Dr between Camp 4 and El Cap Cross are closed. – Roadside parking along Northside Dr between Camp 4 and El Cap Cross is prohibited. – El Cap Picnic Area is closed to all vehicles except vehicles displaying an ADA placard. – The speed limit along Northside Dr between Camp 4 to El Cap Cross is 25 MPH unless posted otherwise. that it is the closest view of Horsetail Fall, has the most parking, has the most room for photographers (by far), and has a bathroom (plug your nose). The downside is there really isn’t a lot of composition variety here, and thousands of others will have already captured something as good as or better than what you’ll get. If you like people, the El Capitan Picnic Area is the place to be—more than any other Horsetail vantage point, this one has a festive, tailgate atmosphere that can be a lot of fun. I suspect that’s because people arrive so early and there’s little else to do before the show starts. And since everyone is pointing up with a telephoto, it’s pretty much impossible for anyone to be in anyone else’s way, which eases much of the tension that often exists when shooting among large crowds. You’ll find the parking lot, with room for twenty or so cars, on Northside Drive, about two miles west of Yosemite Lodge. And in recent years the NPS has blocked a lane of Northside Drive to allow more parking (but don’t park illegally because you will be cited). You can shoot right from the parking lot, or wander a bit east where you’ll find several clearings with views of the fall. Photographed from the bend on the Merced River’s south bank, El Capitan’s extreme sloping summit creates the illusion that you’re somewhere above Yosemite Valley, eye-to-eye with the top of Horsetail Fall—it’s a great perspective. I like this location because the river greatly increases the variety of possible compositions, and also because you can pivot your view upstream to photograph Upper Yosemite Fall, and Sentinel Rock almost directly above you (which also gets fantastic late light) while you wait for Horsetail to light up. The downside to photographing here is that there’s precious little room, both to park and to photograph. This requires getting there a couple of hours early, and also can lead to a bit more tension as people jockey for position. Driving east on Southside Drive, you’ll parallel the Merced River for most of 1.2 miles beyond the turn for Cathedral Beach. The Horsetail Fall spot is right where the road and river diverge. Parallel park right there in one of two narrow but paved parking areas on opposite sides of the road, where you’ll find room for about a dozen cars. Since there’s so little parking here, and Southside Drive is one-way eastbound, if you find no parking (don’t try to squeeze in where there’s no room—I’ve seen rangers doing traffic control and ticketing cars that don’t fit), it also helps to know that the spot is about a ½ mile from the 4-Mile Trail parking area and ¾ miles west of the Swinging Bridge parking area—an easy, flat walk. Regardless of where you set up to photograph Horsetail Fall, it’s pretty difficult to find something that nobody else has done. But that doesn’t mean you shouldn’t try. Since you’ll likely be doing lots of waiting, take advantage of the downtime to experiment with compositions. When the light begins to warm, it’s time to shoot—because you never know when the light will shut off, it’s best to start early and photograph often. Until the light goes away completely, my rule of thumb is that the light now is better than the light a minute ago. Since you have no idea when the light will disappear for good, just keep shooting, especially in the final fifteen minutes before sunset (trust me on this). I’m not suggesting you hold your shutter down in burst mode until your card fills; I usually tell my workshop groups to fire a frame every minute or two until the fall turns amber, then pick up the pace as it goes (fingers crossed) pink and eventually red. The best light is in the final ten minutes before sunset; that’s when you might have a hard time resisting burst mode. Viewed from the picnic area, there’s not a lot of visual interest surrounding Horsetail; your most obvious compositions will be moderate telephotos, up to 200mm or full frame. I use my 24-105 and 70-200 lenses almost exclusively here. Use the trees to frame your shots and let them go black; with a telephoto you can isolate aspects of the fall and eliminate the sky and some or all of the trees. The Merced River bend near Southside Drive is farther away from the fall, with more foreground possibilities, including the river and reflections, so you’ll be able to use a greater range of focal lengths here. Don’t get so caught up in photographing the fall that you overlook wider possibilities that include the river. From either location I think vertical compositions work best (there’s a reason you don’t see lots of horizontal Horsetail Fall images), but that doesn’t mean there aren’t horizontal opportunities too. I like to identify a go-to composition based on the conditions, then vary between wide/tight and horizontal/vertical. If the sky is boring (cloudless), minimize or eliminate it from your composition. If there are clouds that make the sky interesting, by all means include them. If your camera struggles with dynamic range, a graduated neutral density filter will help any shot that includes the sky—a two-stop hard angled across El Capitan parallel to the tree line should do the trick. This usually requires some Photoshop dodging and burning to hide the transition, but it’s the only way to darken the brightest part of the sky, which is usually in front of (not above) El Capitan. A polarizer will alter your results, so if you have one on, make sure you orient it properly. I often have a difficult time deciding between maximizing and minimizing the reflections with my polarizer, so I hedge my bets and shoot both ways. I’ve found that when Horsetail is flowing strongly, minimizing the reflection is best; when Horsetail is more of a wet or icy stain, maximizing the reflection works better. Either way, this is a decision you should make long before the best light arrives. Automatic metering can be problematic in extreme dynamic range scenes when color is paramount, so I always recommend manual exposure, spot metering on Horsetail Fall. To get the color in the fall and Horsetail, I usually underexpose slightly. The trees have little value beyond framing and usually work better when very dark green to black, a fact that’s completely lost on your meter. And monitor your RGB histogram to ensure that you haven’t clipped the red (Horsetail and El Capitan) or blue (sky) channels. Highlight Alert (blinking highlights) is your friend. And perhaps most important of all, don’t get so caught up in the photography that you forget to appreciate what you’re viewing. Just take a couple of seconds to stand back and allow yourself to take in the amazing spectacle of Horsetail Fall. One frequently uttered piece of photographic advice is to “shoot what you love.” And while photographing the locations and subjects we love most is indeed pretty essential to consistently successful images, unless we treat our favorite subjects with the love they deserve, we risk losing them. My relationship with Yosemite predates my memories, so it’s no wonder that Yosemite Valley plays such a significant role in my photography. Of course my love for Yosemite doesn’t make me unique, and like all Yosemite photographers, I’ve learned to share. While it’s nice to have a location to myself (I can still usually find a few of those spots in Yosemite Valley), I’m happy to enjoy Yosemite’s prime photographic real estate with other tourists and photographers. In fact, I get vicarious pleasure watching others view the Yosemite scenes I’ve been visiting my entire life. In recent years I’ve noticed more tourists and photographers abusing nature in ways that at best betrays their ignorance, and at worst reveals their indifference to the fragility of the very subjects that inspire them to click their shutters in the first place. Of course it’s impossible to have zero impact on the natural world—starting from the time we leave home, we consume energy that pollutes the atmosphere and contributes greenhouse gases. Once we arrive at our destination, every footfall alters the world in ways ranging from subtle to dramatic—not only do our shoes crush rocks, plants, and small creatures, our noise clashes with the natural sounds that comfort humans and communicate to animals, and our vehicles and clothing scatter microscopic, non-indigenous flora and fauna. A certain amount of damage is an unavoidable consequence of keeping the natural world accessible to all who would like to appreciate it, a tightrope our National Park Service does an excellent job navigating. It’s even easy to believe that we’re not the problem—I mean, who’d have thought merely walking on “dirt” could impact the ecosystem for tens or hundreds of years? But, for example, before straying off the trail for that unique perspective of Delicate Arch in Arches National Park, check out this admonition from the park. Hawaii’s black sand beaches may appear unique and enduring, but the next time you consider scooping a sample to share with friends back on the mainland, know that Hawaii’s black sand is a finite, ephemeral phenomenon that will be replaced with “conventional” white sand as soon as its volcanic source is exhausted, as evidenced by the direct correlation between the Hawaiian islands age (and the cessation of volcanic activity) and their proliferation of black-sand beaches. While Yosemite’s durable granite may lull photographers into environmental complacency, its meadows and wetlands are quite fragile, hosting many plants and insects that are an integral part of the natural balance that makes Yosemite unique. Not only that, they’re also home to native mammals, birds, and reptiles that so many enjoy photographing. Despite all this, I can’t tell you how often I see people in Yosemite (photographers in particular) unnecessarily cutting trails and trampling fragile meadows and shorelines, either to get in position for a shot or simply as a shortcut. Still not convinced? If I can’t appeal to your environmental conscience, consider that simply wandering about with a camera and/or tripod labels you, “Photographer.” In that role you represent the entire photography community: when you do harm as Photographer, most observers (the general public and decision makers) go no farther than applying the Photographer label and lumping all of us into the same offending group. Like it or not, one photographer’s indiscretion affects the way every photographer is perceived, and potentially brings about restrictions that directly or indirectly impact all of us. If you like barricades, permits, restrictions, and rules, just keep going wherever you want to go, whenever you want to go there. Environmental responsibility doesn’t require joining Greenpeace or dropping off the grid (not that there’s anything wrong with that). Simply taking a few minutes to understand natural concerns specific to whatever area you visit is a good place to start. Most public lands have websites with information they’d love you to read before visiting. And most park officials are more than happy to share literature on the topic (you might in fact find useful information right there in that stack of papers you jammed into your center console as you drove away from the park entrance station). When you’re in the field, think before advancing. Train yourself to anticipate each future step with the understanding of its impact—believe it or not, this isn’t a particularly difficult habit to establish. Whenever you see trash, please pick it up, even if it isn’t yours. And don’t be shy about gently reminding other photographers whose actions risk soiling the reputation for all of us. A few years ago, as a condition of my Death Valley workshop permit, I was guided to The Center for Outdoor Ethics and their “Leave No Trace” initiative. There’s great information here–much of it is just plain common sense, but I guarantee you’ll learn things too. Now go out and enjoy nature–and please save it for the rest of us. This year’s Yosemite Horsetail Fall photo workshop started with bang. Normally I start a workshop with a two-hour orientation, but with six inches of fresh snow on the ground and more falling, I did a lightning orientation (15 minutes) and we sprinted into Yosemite Valley in time to catch the storm’s clearing. We found a world dipped in pristine white powder, a Yosemite photographer’s dream. Normally I like to give my groups lots of time at every location, but in the rapidly changing conditions of a clearing snowstorm (shifting clouds and light, trees shedding snow, and footprints increasing by the minute), I try to hit as many spots as possible while the shooting is ideal. Our third stop that afternoon was Valley View, one of the top two or three photo spots in Yosemite, for obvious reasons. Having visited here so often, I don’t stop here on every visit anymore, but I’d be sued for malpractice if I didn’t take my workshop groups here—especially when it’s glazed with fresh snow. I hadn’t taken my camera out yet, and wasn’t going to get it out here either, but while working with a couple of people in the group just upriver from the parking lot, I saw this view and couldn’t resist the opportunity for something new. When Yosemite is covered with new snow, I look for compositions that emphasize the snow and use the icons as background. Not only did this view give me lots of fresh snow for my foreground, the recent removal of several trees (evergreens in Yosemite are dying from drought and insect infestation) that blocked El Capitan gave me a perspective I’ve never been able to photograph. I set up on the line that gave me the best window between the trees to El Capitan and started with vertical compositions that emphasized the Yosemite icon, but soon switched to horizontal to include Bridalveil Fall and Cathedral Rocks and better feature the reflection. With my Sony 16-35 f/2.8 GM lens on my Sony a7RIII camera, I set up close to the nearby snow-covered trees, then kept moving closer, widening my focal length as I went to include as much snow as possible. After framing the scene to include the least possible blue sky, the most snow, and to avoid crowding Bridalveil Fall too close to the right border, I dialed my polarizer to minimize polarization on the water (maximum reflection), metered with an eye on my histogram, focused on branches about four feet from my lens, and clicked. We made a couple of more stops that afternoon before wrapping up with a truly beautiful sunset at an unexpected (and fortuitous) location. But that’s a story for another day. Cold, wet, exhausted, and ecstatic after a day-and-half of photographing Yosemite Valley glazed with new snow, my brother and I were ready to go home and count our treasures. Gingerly following my headlights down icy Highway 140, I rounded a bend a couple of miles downhill from the Arch Rock entrance station and found my path blocked by an iron gate spanning the road and securely padlocked in place. I knew the park had been closed earlier, but we had been told by the front desk at Yosemite Valley Lodge that 140 had opened hours ago. I glanced at the steep hillside abutting the road and wondered if my Outback could somehow make it around the gate, and quickly discarded the thought. That I even considered it at all was an indication of how desperate I was to go home. We’d arrived in the park Monday afternoon, got a room at the lodge, and hunkered down against the incoming storm. What had been forecast to be 3-5 inches of overnight snow had just been upgraded to 12-16 inches, so we knew we’d wake Tuesday morning to something exceptional. A peek through the curtains in the predawn darkness confirmed a world of white, with the snow still falling hard. A check of the Yosemite road conditions hotline confirmed it: not only were all park entrances closed, all roads in Yosemite Valley were closed. I trudged through the snow in the twilight to survey the photography potential near the lodge and found the view of Yosemite Falls completely obscured by clouds. The cafeteria was open, but serving nothing because the employees couldn’t make it to work. At the adjacent Starbucks I found only two people had been able to negotiate the snowy darkness to get to work—it turned out to be the Starbucks manager and his wife, a non-employee drafted into action and put on the front line. On my way back to my room I swung by the parking lot and checked my car. About the time I identified the correct white lump, Yosemite Falls made an appearance and I hustled back to the room for my gear. But by the time I got there it had been swallowed by clouds. Shortly after returning to the room we got a call from the front desk telling us outbound Highway 140 had reopened. We had no plans to evacuate, but I took this as a signal that the valley roads would be open too (otherwise, what use would there be to open 140). So we dug out my Outback and hit the road. With snow still falling, the next few hours were spent circling Yosemite Valley, stopping occasionally when a view appeared, waiting for the clearing that had been promised for late afternoon. When the storm broke, it broke fast. Blue sky appeared and spread quickly and we move around with much more urgency, hitting as many locations as possible while the snow remained on the trees and before the clouds disappeared completely. Most of the views I chose required battling our way through several feet of fresh, wet snow, an exhausting exercise almost always rewarded with a spectacular view. Pristine snow signaled that we were the first people at every spot we visited. In hindsight that should have been a clue that the park was more shut-down than we realized, but we were too excited by the sights for rational thought. By the time we got to the day’s final location, the clouds had all but vacated the sky. A thin skin of ice obscured the reflection I’d hoped for, so I went exploring and found this view of El Capitan framed by snow-dipped shrubs. A small cloud hovered on El Capitan’s summit, reflecting a faint pink courtesy of the sun’s last rays. Framing the scene with my Sony 12-24 (on my Sony a7RIII), I widened all the way out to 12mm and moved to within a couple of feet of the shrubs to include as much snowy foreground as possible. A perfect cap to a memorable day. But now I found myself standing in the middle of Highway 140, jiggling the padlock on the gate to make sure it was really locked, scanning the shoulder for escape routes, and wondering if I was going to make it not only home, but to the Bay Area for a talk I was scheduled to give the following day. I had no phone number that would connect to a human at that hour, and no cell signal with which to do it anyway. Just about the time I was about to return to my car and admit defeat, a pair of headlights rounded the curve. But instead of pulling up behind us, the truck drove around my car and pulled right up to the gate. This wasn’t a tourist who had missed the same memo I had missed, it was a large work truck filled with maintenance workers returning to the yard after a long day in the park. Soon the driver’s door opened out popped the driver, fumbling with a lump of keys. I couldn’t believe my luck when the gate swung open, but I darted through before he could change his mind (or tell me that he didn’t have the authority to let anyone exit). Without slowing I waved my thanks and motored past him, heading home. 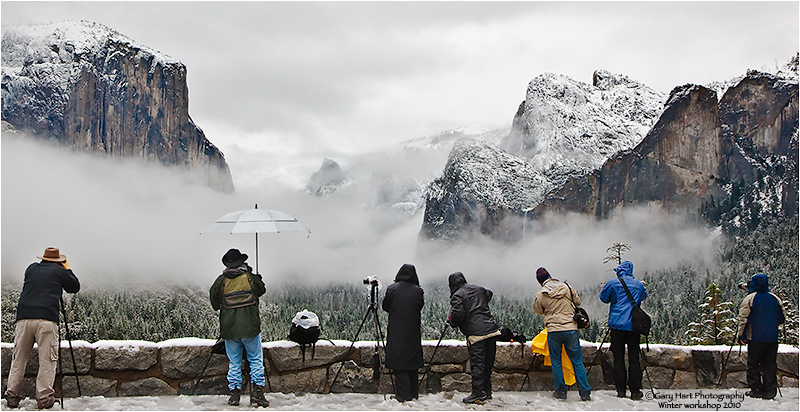 Last winter I spent a glorious day by myself in Yosemite Valley, photographing the vestiges of an overnight snowstorm. Inbound to the park the evening before, a continuous strand of outbound headlights reminded me how different a photographer’s priorities are from the general public’s. For a nature photographer, the best time to be outside seems to be everyone else’s worst time to be outside, but we know that before breakfast, at dinnertime, after dark, and wild weather are when all the best pictures seem to happen. I arrived in Yosemite Valley with just enough light to see El Capitan and Half Dome engulfed in heavy clouds that hinted at what was in store—but so far no snow. With a storm imminent, I had no problem getting a room at a significant discount, virtually unheard of on a typical Yosemite evening. A light mist started after dinner, and I fell asleep to the sound of raindrops tapping leaves outside my window. The next morning I woke before my alarm and lay still, listening in the darkness to the unmistakable silence of falling snow. Dressing quickly, I opened the door to six inches of untouched snow. In the parking lot I tried to determine which white lump was my Outback, repeatedly punching the lock button on my key fob and following my ears to the lump that chirped back. A little digging confirmed my discovery, and after a few more minutes of excavation I was able to to ease out of my parking space, carving the first tracks into what was probably the road (fingers crossed). The clouds that had deposited all this powder seemed be trying to squeeze out every possible flake, but they seemed exhausted from their overnight effort and my wipers had no problem keeping up. When the final flake fell a little before 9:00, I was traipsing through drifts near El Capitan Meadow. Patches of blue sky overhead told me it wouldn’t be long before the trees were shedding snow in clumps, so I headed quickly to a favorite spot by the Merced River, hoping for a reflection while the world remained white. The Merced here was so still and clear that I had to look twice to be sure there really was water in the river. The reflection on the far side was exactly what I had in mind, but the corrugated riverbed on my side was an unexpected complement that wonderfully matched the herringbone clouds above. In the days before my Sony 12-24 lens, I wouldn’t have been able to include all of El Capitan and its reflection in a horizontal frame, but 12mm gave me room to spare (I’m still startled at times by how big the difference is between 16mm and 12mm). I got lots pictures that make me happy that day, but even more than the pictures, I think I enjoyed the rare opportunity to feel alone in Yosemite for a few hours. The park wasn’t empty, but between the scarcity of people, the reluctance of those who were there to venture onto the roads, and the sound-deadening effect of powdery snow, I had no trouble pretending. What many photographers fail to realize is that the “proper” lens is determined by the photographer, not by the scene. While there is often a consensus on the primary composition at a location, that usually only means the first composition everyone sees. But if your goal is to capture something unique, those are just the compositions to avoid. And as every photographer knows, the best way to guarantee you’ll need a lens is to not pack it. I’m not suggesting that you lug Hermione’s purse to every shoot—just try to remember that your images will last far longer than your discomfort. In my Canon life, my personal rule of thumb was to always carry lenses that cover 16-200mm, regardless of the scene, then add “specialty” lenses as my plans dictated: macro for wildflowers, fast and wide prime for night, and super telephoto for a moon. That meant the 16-35, 24-105, and 70-200 were permanent residents of my Canon bag, and my 100-400, 100 macro, or wide and fast prime came along when I needed them. Shooting Sony mirrorless, with its more compact bodies and lenses, I now carry a much wider focal in a lighter camera bag. My new baseline (always with me) lens lineup is the Sony 12-24 G, 24-105 G, and 100-400 GM, plus the Sony 2x teleconverter. My macro and night lenses still stay behind (but they’re usually in the car), but in my bag I always have lenses to cover 12-800mm, a significant advantage over my Canon 16-200 configuration. It’s kind of a cliché in photography to say “It’s the photographer, not the equipment.” And as much as I agree in principle, sometimes the equipment does help. Wherever I am, I regularly find compositions beyond 200mm, compositions I never would have considered before. And the 12-24 lens has enabled me to approach familiar scenes with a completely fresh eye. A recent example came on a snowy day in Yosemite early last month. Moving fast to keep up with the rapidly changing clouds and light, I stopped at El Capitan Bridge, directly beneath El Capitan. Having shot this scene for years (decades), I was quite familiar with the perspective. So wide is the top-to-bottom, left-to-right view of El Capitan here, even at 16mm I’ve always had to choose between all of El Capitan or all of the reflection, never both. I never dreamed I’d be able to get El Capitan and its reflection in a single frame. But guess what…. Standing above the river near the south side of the bridge, I framed up a vertical composition and saw that at 12mm I could indeed fit El Capitan and the reflection, top to bottom. Whoa. With very little margin for error on any side of the frame, I moved around a bit to get the scene balanced, eventually framing the right side with the snowy trees lining the Merced. My elevated perch above the river allowed me to shoot straight ahead (no up or down tilt of the camera) and avoid the extreme skewing of the trees that’s so common at wide focal lengths. 12mm provides so much depth of field that I could focus anywhere in the scene and get front-to-back sharpness; the flat light made exposure similarly simple. With composition, focus, and exposure set, all I had to do was watch the clouds and click the shutter, my heart filled with gladness….